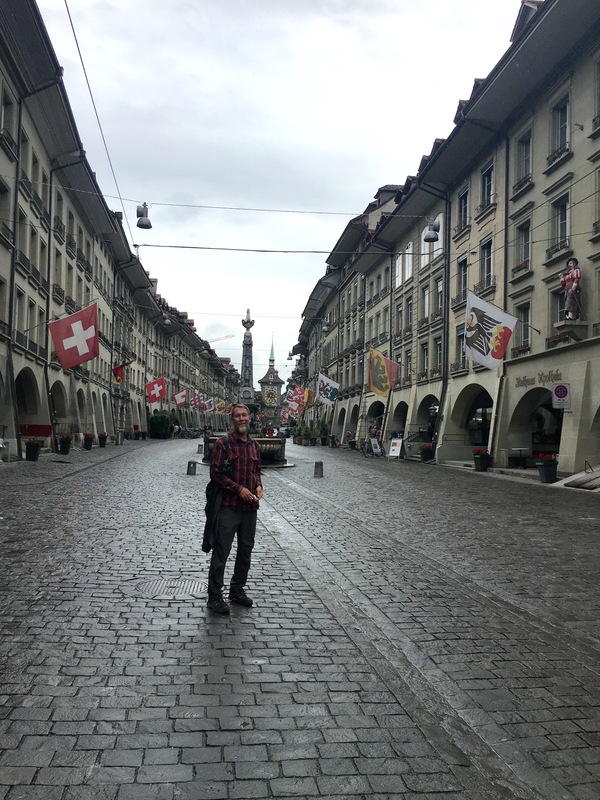 Today we did a little “iron blazing”–we took the train to Bern, skipping a little over 30km of the Trans-Swiss trail. 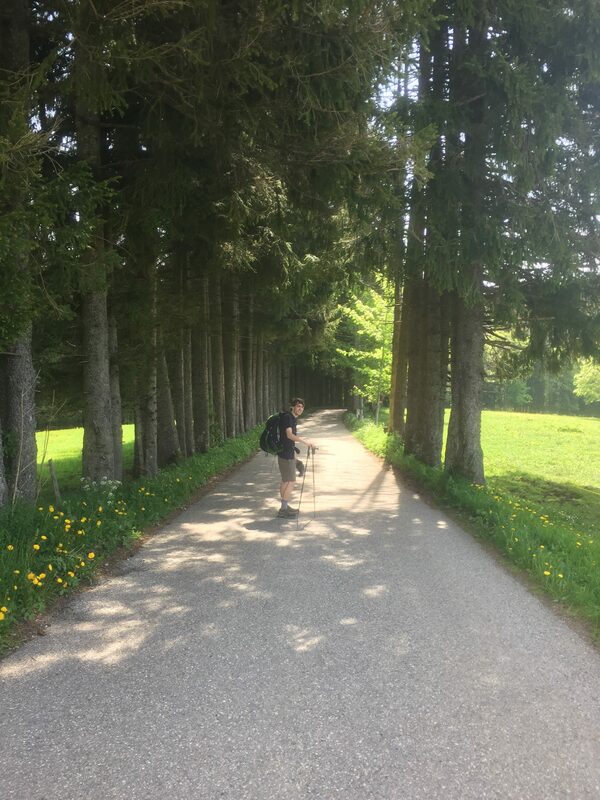 Had we walked that stretch it would have been more of the fields we’ve been doing and, because Bennett has limited time, he would have fewer days in the alps. 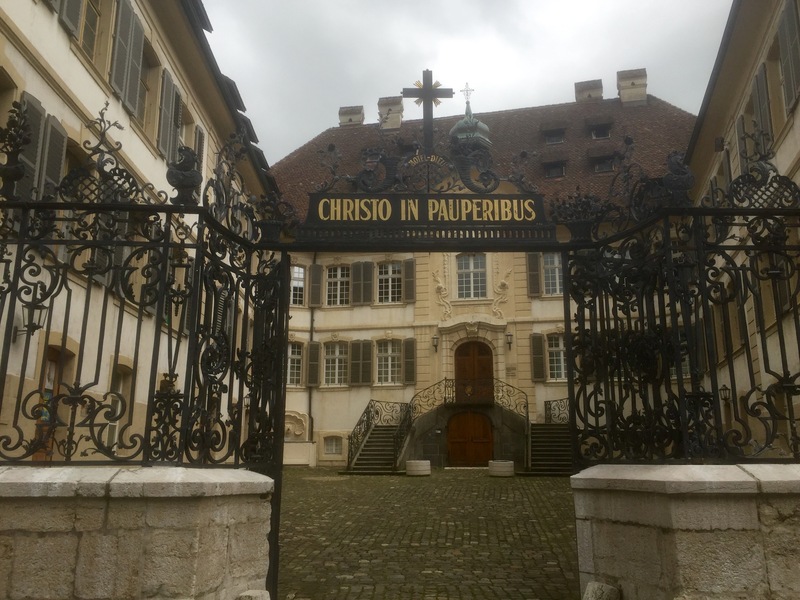 It also gave us more time to explore Bern, one of my favourite cities though it rained most of the day, so a dry train car was a blessing. The downtown of old Bern is the perfect city to wander in the rain because the sidewalks are all arcades (vide Walter Benjamin), but after we traversed the peninsula to the hostel we had booked (but not gotten confirmation), we discovered there were no rooms to be had in Bern because an AC/DC concert (and of course no tickets for that either). The proprietor of the hostel got on the phone and found us a fairly inexpensive B&B out by the train station, so our visit was saved, though the downpour coupled with everything being closed on Sunday, made the visit a little flat. We did stop by the Pickwick Pub to watch Swiss league soccer–Zurich vs. Lugano–with an intense and a little rough looking crowd, all wearing their AC/DC merch. Had a few English pints, a welcome relief from watery German lager, then a big vat of fondue for dinner — after all, it is Switzerland– and made an early night of it. Tomorrow we start putting in the KMs. Walking a narrow river valley, turning at a gap in the surrounding range to climb over to the next, then crossing it for the next– that’s walking in this corner of the world. Each kilometer brings something different– wheat field, yew forest, meadow with milk cows, beech forest–sometimes walking a dirt path, sometimes a paved narrow road–the greatest variety. What was supposed to be a long day was thankfully shortened by good surface and steady walking. The first day in a very long time that started off warm and just got hot. Crossing the middle valley near Chazard was in full baking sun which, because of my perpetual spring year, I have rarely dealt with. Some excitement occurred when closing a steel gate. 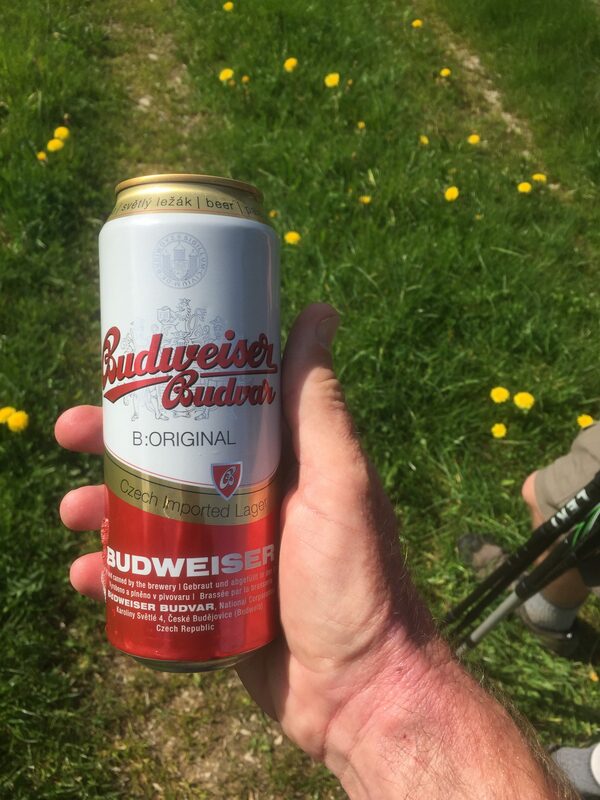 I accidentally punctured a can of Budvar (Budweiser from the Czech Republic– had an extra one left over which I stuck into the outside of my pack). Suddenly something was foaming down my back, which we resolved by drinking it down–a substitute for our usual mid-morning break. Rounding the last ridge, we soon could see lake Neufchatel with the alps in the distance, starting to feel like the Switzerland I expected to be hiking. The French cantons in Switzerland are known for agriculture, which seems primarily to be dairy, and watchmaking. Yesterday walking into St-Imier Bennett and I peered into a high tech lab, speculating about what they were studying with all the clean rooms and microscopes. It was a watch factory–something stunning in an era of throwaway digital chips. 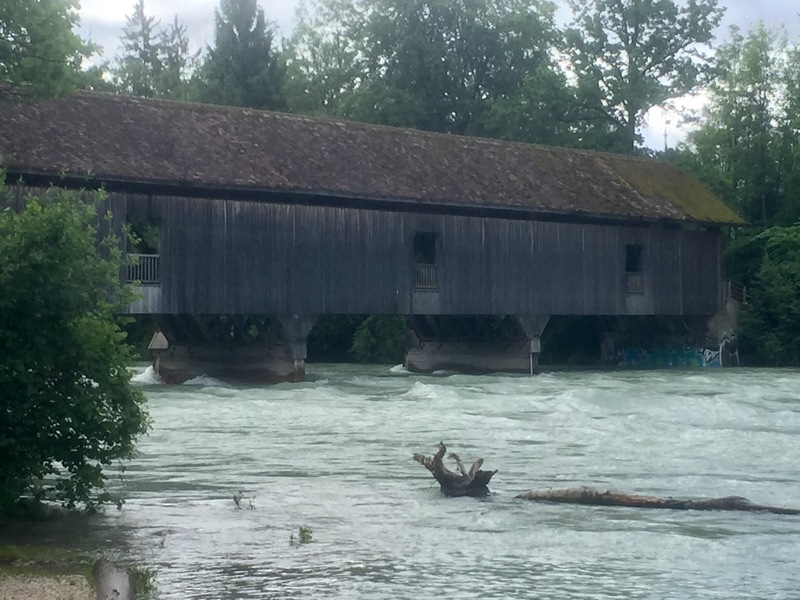 We needed to divide the distance to Neufchatel into two days which gave us a short day into St-Imire, which including sitting on the square for a late lunch, living at the right pace. 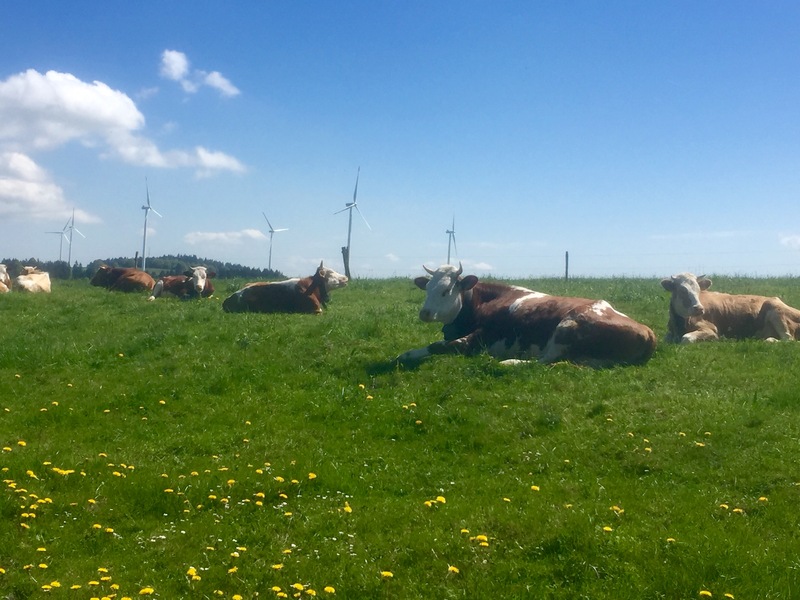 This area does not have spectacular beauty– no rugged alps in the distance just yet, but meadows full of wildflowers, cattle, horses and rimmed with old growth forest has its own overwhelming beauty. It is a place to walk. Robert MacFarlane along with Stanley Donwood and Dan Richards wrote a beautiful little book called Holloway. A holloway is “a sunken path, a deep & shady lane. A route that centuries of foot-fall, hoof-hit, wheel-roll, & rain-run have harrowed into the land.” In other words, a holloway embodies and records a human history of acting in and with the non-human world, a world made of earth, stone, water, but also animals, wheels, wagons, and tools. I recently finished the Camino Frances path of the Camino de Santiago, crossing the Pyrenees near St. Jean-Pied-de-Porte and walking through Pamplona, Burgos, and León to Santiago de Compostela, and then beyond to the Costa de Morte, to Muxia and Finisterre (900 kilometers). Though its paths are not usually as deep as the holloways MacFarlane explores in England, they record a deep history, one of pilgrimages to Finisterre that even predate the Christian Era. While parts today must be re-routed to newer paths to avoid trekking on what have become major highways, the Camino breaths a complex history, passing by every church in its path, but also circling natural formations, avoiding rugged climbs, reflecting the wisdom of the choices made by centuries of walkers. With each step, the modern peregrino is constantly aware of those years of wear, an overwhelming sense of human and nonhuman history. It may seem odd to turn to a French philosopher of science and technology to talk about attitudes toward the wilderness and human history, but Bruno Latour, in his early book We Have Never Been Modern and the recent An Inquiry Into Modes of Existence gives a vocabulary to help frame these observations. At the risk of oversimplification (which is inevitable given the length of this essay), We Have Never Been Modern is a critique closely related to Alfred North Whitehead’s notion of the “bifurcation of nature” which initially was a criticism of the philosophical distinction between an object’s primary and secondary qualities but eventually becomes a tool to dismantle the subject/object distinction that has dominated modern philosophy at least since Kant which is the avowed purpose of An Inquiry Into Modes of Existence. In Latour’s timeline, Modernism began (or did not actually begin) when Western philosophy accepted and enforced a rigorous distinction between the subject and the object. An accomplished modernity would be one that could rigorously control the boundary between knowledge of the natural world and of human society. Latour’s insight is that while that wall might be tall and seemingly impregnable, it (like all geopolitical walls real or imagined) cannot stop subject/object hybrids (what he calls “quasi-objects” and “quasi-subjects”) from proliferating. No matter how hard the modern knowledge police work, the subject/object distinction cannot be maintained for long. A nature untrammeled by human contact and history, one seen only from a scenic overlook or walked on paths that were never built for transportation or human labor, is the wilderness ideal. From that perspective, American long-distance trails mimic the modernity Latour decries, one that erases the history of the material world and the imprint of human thought and action on the landscape. They are a celebration of Nature purged of all humans except the limited few with the strength, stamina, time, and financial wherewithal to make the trek. The holloway is an example of the sort of hybrid Latour invokes to destabilize the notion of an accomplished modernity. The holloway is objective, made of what we would call natural objects–dirt, stones, trees, roots, plants–and is subject to natural forces–rain, wind, drought, frost heave. But it is also social as it was made and is maintained by human activity, serving as a conduit for labor, play, transportation, and human contact. To walk a path is to live its history and trip over its ruts, at the same time! The modernity Latour critiques is one without history, and many ways it is one without thought. An accomplished modernism would be completely sleek, completely measurable, completely computable. 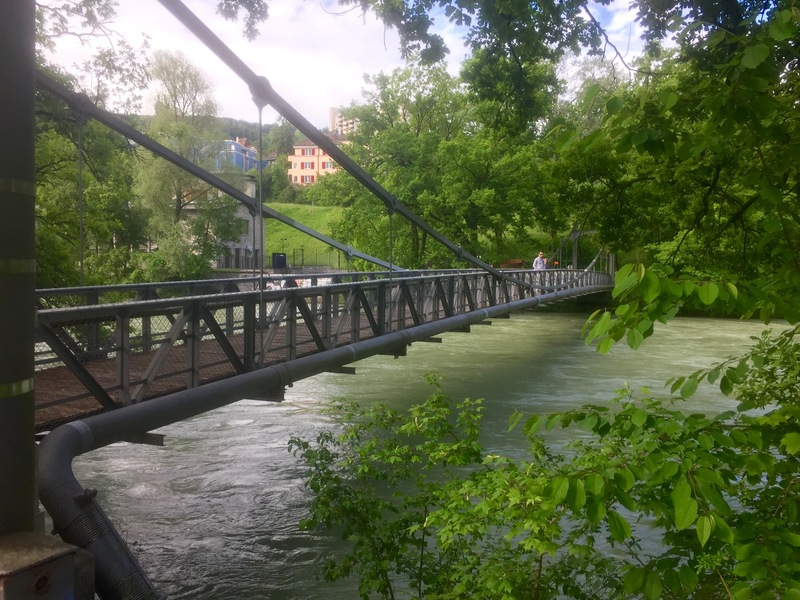 It demands a seamless infrastructure, one that never calls attention to itself (see “Swinging Bridges”). In many ways, it is the neo-liberal dream. 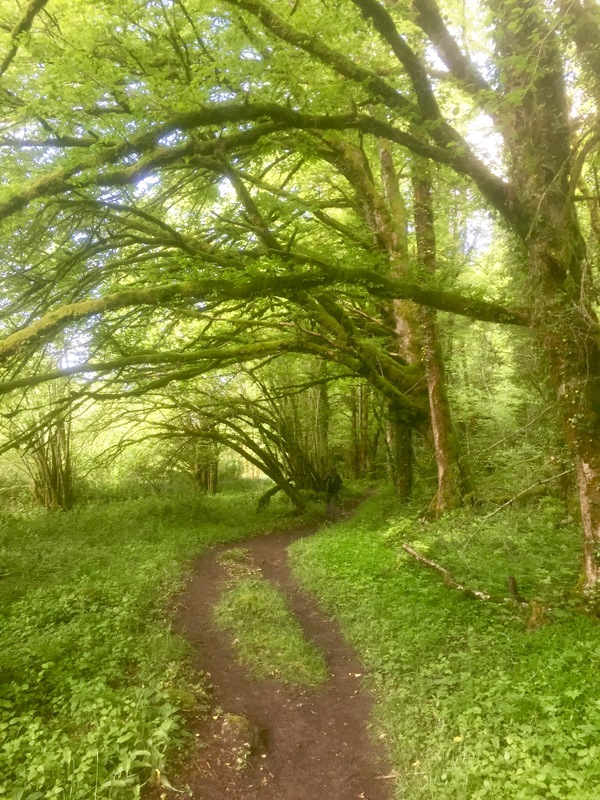 Walking a holloway track– the Camino de Santiago or Nepal’s Helambu circuit–is to feel a sedimented history, but also much more. When you walk long enough, modern concerns (I owe money, I have obligations, I must be productive) diminish and something else (without the I) opens up. A range of forces come to bear–gravity, oxygen levels, a fine-grained sense of the weather, attention to flora, fauna, the impress of human activity, and memory. These and other factors constitute a mood that can open to reflection and ultimately open onto the possibility of thinking instead of having thoughts which, like ideas, become tokens to move about in some discourse to be measured and validated by a calculus of intellectual activity. The latter–thoughts–are prized by the neo-liberal academy as they can be converted into statements that circulate as a proxy for thinking and an emblem of intellectual activity, but are actually a faint shadow of the non-modern experience of thinking. In that light, the academia’s long slide from celebrating wisdom to knowledge (18th century) to information (20th century) to data (21st century) is to the neo-liberal university, a place of constant self-assessment, periodic review, and impact analysis, a machine designed to halt thinking in its tracks. The optimism of Latour’s book is his claim that we have never been modern, that such a state can never be accomplished because the boundary between subject and object, self and world, is a chimera. Purification gestures may create power relations and try to reduce thinking to having thoughts, but the hybrid I am calling thinking proliferates outside those boundaries, in a world that never was modern. On morning I woke in a Kathmandu hotel with no electricity which is of course a regular occurrence in most of the world. Technological differences tend to be what we first notice when visiting other places. Heading out of the city deeper into the mountains is a move toward fewer conveniences and what seems a simpler life. Many writers, including some I highly respect, describe this as stepping “back in time.” I understand what they mean. In isolated rural areas, the daily practices of the people living there are often quite similar to those of their ancestors. Farmers tilling narrow terraced fields with short-handled heavy hoes or metal-tipped wooden plows with a yoke of oxen is a scene repeated for centuries if not millennia, so for visitors, it is of an antique simplicity. However the “back in time” attitude is the result of a parochial sense of modernity. Yes, without doubt, the people living in, say, Melamchigaon are not working in sanitized, hermetically-sealed, climate-controlled environments staring at computer screens all day, but they live in the 21st century, surrounded by artifacts of that era including the ubiquitous steel and aluminum sheathing, cell phones, polyester jackets, airplanes and helicopters circling, soldiers patrolling with automatic weapons. While they may not be in a high-tech envelope, they, like the vast majority of the world’s population, are in the larger 21st century world. The place where they live and work is a hybrid of high tech and traditional practices that a narrow, hyper-modern view overlooks. What the “back in time” trope brings is a sense of distance from and a concomitant blindness to the hybrid nature of all our lives. Silicon Valley daily life is also full of activities long practiced by humans but overlooked in pursuit of a digital totality. Ezra Pound’s plea to “make it new” starts with an “it” that is modernized, but the “it” and all its deep history is sedimented in that “new.” Stepping into Melamchigaon is not a temporal disjunction. It is spatial. It is stepping into a different modernity or, to use Latour’s terminology, into the non-modern world where we have been all along. Mud, but pure pastoral beauty. Today’s walk was a little tough toward the end– just need to get back into shape–but beautiful in an understated way. This region is steep, but not stupendous, an agricultural area with lots of muddy pasture crossings. The path followed Les Doubs River upstream across wildflower spring fields through a narrow valley. Some times it was clearly Switzerland, but others could have been part of the Appalachian trail. It was a walker’s path, bringing small technical challenges — avoiding hidden mud holes, sliding up and down muddy slopes–but also bringing the small joys: flowers, fast-moving streams and the occasional small falls, moss covered rocks and trees, and of course silent, ancient forests. This should be a good trek. 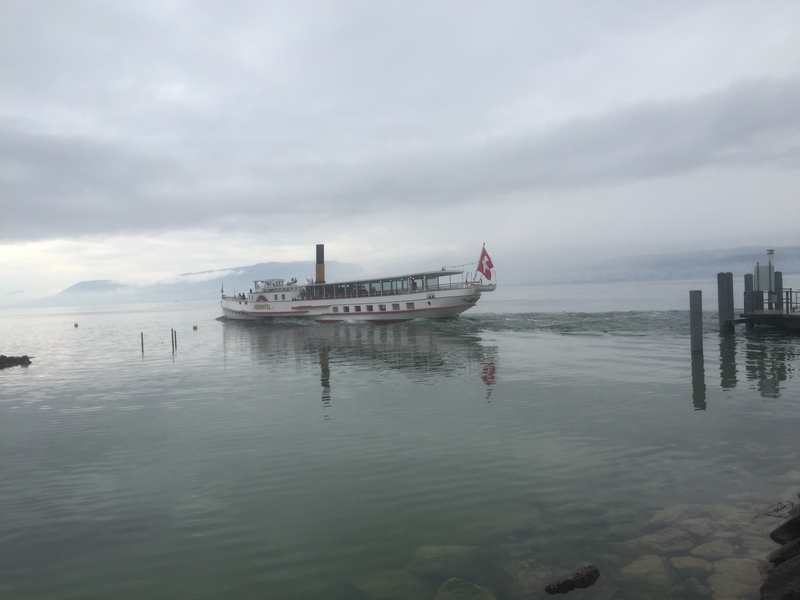 Not an ambitious first day– getting our legs back and learning to navigate in a new country. Did climb up an over a ridge or two, but nothing difficult. It was fun to watch Bennett note the little differences in the world– the steep pastures, the heavy cow-bells, the design of the houses. For me, what was most noticeable compared to Spain was the move from stone to wood building. 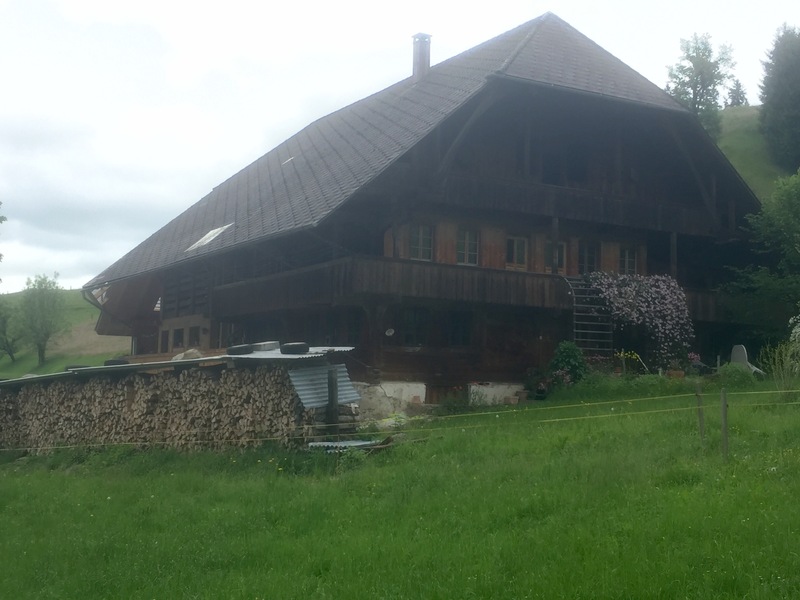 The classic Swiss masonry first story with large wood overhanging second and third stories. Beautiful, but so different from the world I walked the last six weeks. One other difference, perhaps related to the weather, but also likely a cultural difference is how quiet the towns are. In Spain, when you walk into a town, the cafes are open and people sit out with coffee, beer, tapas, and conversation, a certain liveliness. So far (and we have only seen a little corner) the towns feel almost empty — deserted–on arrival. It is early in the tourist season, and these are small towns, but at times it feels eerie. Still Bennett and I kept each other company and had a great walk. Hoping it is not a harbinger of what is to come, it rained hard all night and through the first part of the morning. Certain to be some muddy trails, but today is a day to read and write, waiting for Bennett to arrive late this evening. Wandered the town a bit, stopped by information center and Migros grocery store. Spent the afternoon in a bar reading Bruno Latour and working on an essay, then the evening watching the people stream off each successive train until the one bringing Bennett arrived. 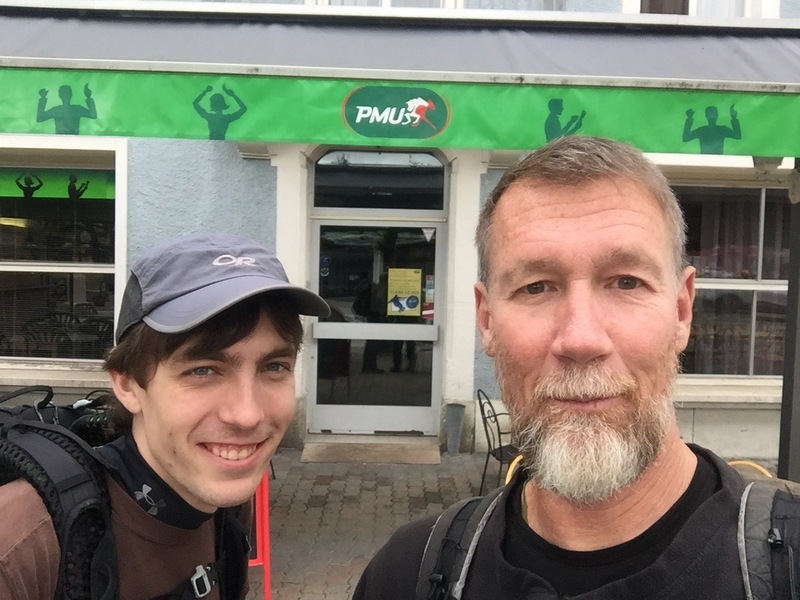 I had not seen him since we had hiked part of the PCT in August of 2015. Obviously a joyful reunion, with non-stop talking.